I just bought Samsung’s new 900X Laptop. One of my favorite things about this laptop is that it gets 4+ hours of working time (in flight mode), so I can literally work for 4+ hours straight without finding an outlet. There’s just one word for that: AMAZING! But when you’re flying through multiple airports, as I recently did going from Denver to Portland (via Seattle), the total travel time can be longer than 4 hours. Knowing this, I hunted at Denver International Airport for outlets before boarding my flight. We’re a power hungry society. Every one of the 8 or so outlets in the waiting area were taken. 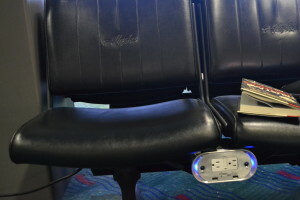 So, I was super pleased to see that in the Alaska Airlines waiting area in Seattle’s airport, there were power plugs built in under every other seat. These plugs include USB power plugs as well. This means that there is an outlet installed for about every 4th passenger on a flight, right in the waiting area. There’s also free Wifi in Seattle. With power and an Internet connection, waiting in an airport is just like being anywhere else for me… I can write posts, get work done, and it makes the time go very quickly in-between flights. I’m not sure if Alaska Airlines paid for these upgrades, or if this was done by the Seattle airport. Regardless, it made my layover in Seattle a very pleasant experience and gave me an opportunity to be fully charged for the 2.5 hour flight to Denver. Congratulations and thank-you to whoever (Seattle airport or Alaska airlines) put in these upgrades for travelers. ← Poem: Into Whose Pockets?